either side of an issue and hurl abuse at one another. The winner will be declared when something significant changes in the macro-economic position of the UK. The game was played when Britain entered the ERM (those who said it would be a disaster won). The current double dip debate is another example. This time, the principal players on one side are the former Bank of England policymaker Professor David Blanchflower and the TUC general secretary Brendan Barber. On the other, is George Osborne. circumspection, that cuts "will do terrible and probably irreversible damage to the British economy. I am now 100 per cent certain these actions will push us into double-dip recession." that, "The coalition obsession with slashing jobs and services to reduce national debt risks hurtling us into a dangerous double-dip." cuts will have crashed the economy. Tory policies will cause a ‘double-dip’. If there is a real-terms cut, it is at best marginal. 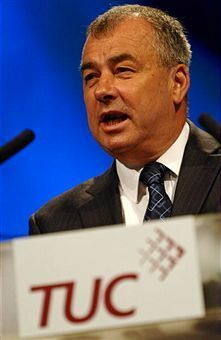 That makes Blanchflower seem silly, but Brendan Barber looks ridiculous.